While the Radio Music Licensing Committee and Global Music Rights continue to pursue anti-trust litigation against each other, the boutique performance rights organization started by Irving Azoff is offering temporary licenses that will allow radio stations to continue playing GMR songs without worrying about copyright infringement lawsuits. According to a statement issued on behalf of GMR by lawyer Dan Petrocelli of O’Melveny & Myers, representing the PRO in the antitrust litigation; and a letter to RMLC members from RMLC chairman Ed Christian, radio stations have until Jan. 31 to sign an interim license agreement with GMR, which will cover them for playing the PROs songs through Sept. 30, 2017. Each station willing to enter into the interim license has to contact GMR to see what their fee will be. However, the interim licensing agreement will leave each party the right to seek a retroactive fee adjustment, which could be based on a future licensing agreement subsequent to the interim license; the outcome of the antitrust litigation between the RMLC and GMR; or a possible rate settlement between the RMLC and GMR…. In fact, some music from songwriters in the Who, the Eagles, and by John Lennon and Drake, are no longer covered by ASCAP or BMI, and radio has been playing that music all along during 2016. But people familiar with GMR say they had no intention of suing for copyright infringement as long as RMLC was negotiating rates with the PRO. Instead, they claim, the RMLC ambushed them with an antitrust lawsuit filed on Nov. 18 in the U.S. Eastern District of Pennsylvania Court by the law firm of Latham & Watkins. GMR filed its own anti-trust lawsuit, via O’Melveny & Myers, against the RMLC in California Federal Court on Dec. 6. The songs at issue appear to be for GMR writers who left ASCAP in the last couple years, but arguably remain covered by ASCAP (and BMI) agreements expiring at the end of 2016–you know, next week. A property right is the exclusive authority to determine how a resource is used…One [attribute of private property] is the exclusive right to the services of the resource. Thus, for example, the owner of an apartment with complete property rights to the apartment has the right to determine whether to rent it out and, if so, which tenant to rent to; to live in it himself; or to use it in any other peaceful way. That is the right to determine the use. If the owner rents out the apartment, he also has the right to all the rental income from the property. That is the right to the services of the resources (the rent). Finally, a private property right includes the right to delegate, rent, or sell any portion of the rights by exchange or gift at whatever price the owner determines (provided someone is willing to pay that price). If I am not allowed [or not required] to buy some rights from you and you therefore are not allowed to sell rights to me, private property rights are reduced. Thus, the three basic elements of private property are (1) exclusivity of rights to choose the use of a resource, (2) exclusivity of rights to the services of a resource, and (3) rights to exchange the resource at mutually agreeable terms…. The MIC Coalition routinely runs over the rights of recording artists to fair compensation for the use of their recordings, so it’s a fair assumption that they are used to riding rough on creators and intend to do so with GMRs writers. We can all be thankful that GMR is both standing up for their songwriters and acting reasonably to allow business to get done. Hopefully, mega media corporations will decide that their resources are better spent paying a fair royalty to the songwriters that drive their business rather than unproductive litigation. What if Legacy YouTube Licenses Went Away? Will Artist and Songwriter Opposition to YouTube Make it Easier for Labels and Publishers to Step Away from Licensing? As manager Irving Azoff noted in his “Open Letter to YouTube“, the music community has never been more united against Google’s misuse and abuse of the government mandated “safe harbors”. When mixed with Google’s dominant market position, highly litigious business practices and massive lobbying effort, negotiating with Google is not really negotiating–one of the main reasons all such activities are cloaked in nondisclosure agreements. In response to Mr. Azoff, one of the few in the music industry who has stood up to Google, a YouTube star asked why does the music industry keep taking the money from YouTube if it’s so awful. That’s a very, very good question and I’m so glad he brought that up. What typically happens in the last few YouTube negotiations is that Google gradually ratchets up the advances and eventually the labels and publishers acquiesce. What’s different this time is that the deals are being made in a highly public way–the artists and songwriters who ultimately call the shots contrary to popular myth are going to have a hard time relinquishing their public positions against Google and YouTube in return for thirty pieces of silver. The changes that artists and songwriters require at Google go far beyond money. What is needed is for Google to change its behavior, something that Google refuses to do because it’s business model is built on an extreme interpretation of the outmoded “notice and takedown” provisions of a 1998 statute that is a massive failure largely because of Google’s misuse of those provisions to Google’s great profit. To the extent that lawmakers know the details of YouTube’s operations at all (and many don’t know the fundamental fact that Google owns YouTube), many lawmakers believe that Google provides the tools to block the unauthorized use of music on YouTube. This is principally through Google’s “ContentID” and “Content Management System” applications. These applications do not work very well, despite Google’s well cultivated reputation for solving Internet problems. DMCA abuse is a problem that Google created due to its selection of a legacy business model. What some lawmakers are now finding out for the first time is that Google does not make these tools available to everyone, but instead YouTube has a chicken-and-egg definition of who gets these tools that tiptoes around an essential fact–you only get ContentID if you grant a license to YouTube. And if you don’t? If YouTube negotiations fall apart this time, Google will no doubt try to spin the failure away from its misuse of the DMCA safe harbor to extract the payment of shakedown money to “copyright misuse” of the major labels and publishers responding to the desires of their artists and songwriters. 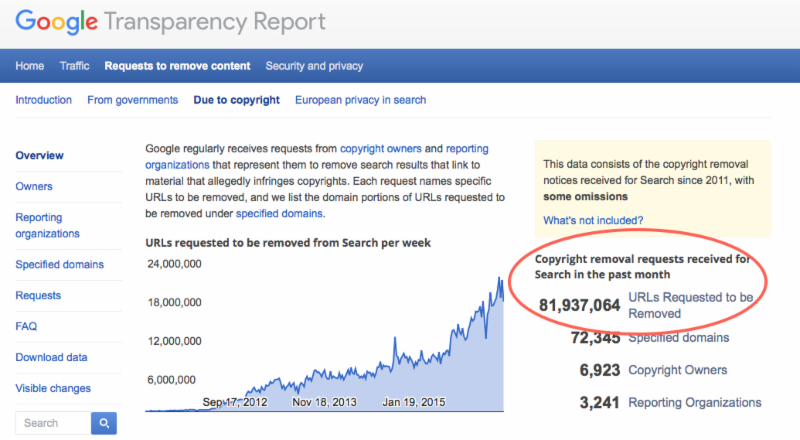 The truth is there is no amount of money that Google can pay that will make up for the costs of enforcing the DMCA notice and takedown, most of which have to be borne anyway, license or no license. Given the commitment of the artist and songwriter community to stopping DMCA abuse, particularly by Google due to its dominant market position and the legacy businesses it has built that are dependent on a compliant artist community (not to mention compliant lawmakers who look the other way), I wonder if the labels and publishers think that taking the king’s shilling is worth spending the political capital to offend their artists and songwriters who have gone all in on opposing Google’s legacy business practices. On the other hand, if Google promotes ContentID and CMS as solutions, shouldn’t Google make these tools available to all creators? Should Congress require Google to not only make the tools available to everyone, and even expand the application of these tools to search results to counter the massive infringement Google enables through search? It is not quite too late for Congress to fix this mess. The safe harbors were intended to give a little latitude to reasonable people acting reasonably. The DMCA was never intended to be an alibi.